Sync is our producer newsletter. Sign up to receive the next monthly issue in your email. Surviving and thriving as a producer in this recession is harder than ever. Stations are paradoxically even more picky and hungry for great radio. This month, we share details about making your pieces attractive to stations and promoting your work on PRX and elsewhere online. Plus, get tips on “funding your bliss” from producer Dmae Roberts. Thanks for your great feedback to our first newsletter and happy summer! We keep a complete list of what stations are buying (also on Twitter). Following the rules below will help increase the chances that your work will get purchased, too. Relevance: Timeliness, tonal “fit,” technical excellence, topicality. Care: Be sure that your piece can be played for Mom without her spilling her coffee. The FCC is more vigilant than ever and the average age for public radio listening is late 40s to early 50s — so, think about that when you choose your words. Use the content advisory field when you post a piece on PRX! Originality: Some stations are looking for new sounds, new voices, new approaches. For example, Nate DiMeo’s podcast series The Memory Palace found a home on major market station KUT in Austin. Programmatics: Can your pieces — even the best ones — fit the way stations program? A 62-minute program will have a hard time finding a home; so will one that runs 22 minutes. Look at programming clocks. Also, make it easy for stations to use your pieces: remove recorded intros, use plain outcues without station IDs, etc. Finally, what matters most, perhaps, is listening to stations on which you’d like your work to air, then building relationships with people there. And you can reach those folks through PRX! Showcase your best audio on your PRX profile. Our Promoting Your Work guide gets really specific and has tips from fellow producers. Do you have mortgage crisis stories? Roughly 77 public TV and radio stations are collaborating on a huge project to engage audiences on the mortgage crisis. If you have solid stories, profiles, raw audio, docs, or smart commentary, post it, let us know, and we’ll do our part to alert stations. Browse Dmae’s tips on writing a winning grant proposal, coping with rejection and more. Hear Dmae’s work on PRX. Stations will be programming around these events and subjects. Tell us what you have that fits! Know someone who would like producer updates from PRX? PRX, Inc. is a non-profit corporation based in Cambridge, Massachusetts. 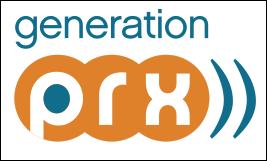 PRX was created through a collaboration of the Station Resource Group and Atlantic Public Media, and continues to receive support from public radio stations and producers, The Corporation for Public Broadcasting, The National Endowment for the Arts, The Ford Foundation, the John D. and Catherine T. MacArthur Foundation, the Open Society Institute, the Surdna Foundation, and Google Grants. On Air photo by Ben McLeod. Thumbs up photo by Joel Telling. Dmae Roberts photo courtesy of Dmae Roberts.